Some might prefer the new name, Chennai. But to me, the rather colonial name, Madras sounds better. Whatever the name,the city celebrates its 369th birthday today. Although I may not be a Chennaite by birth, the city still remains fond to me. When I first came to Madras 10 years back, I actually hated the city for its heat. But in time, I realized Madras is not just about the heat. What fascinates me the most is the history behind the city. The name Madras itself is Portuguese. The Portuguese had named a village that lies to the north of Fort St.George as Madre de Deus. The locals began to call it Madraspattinam and the British, Madras. The city owes a lot to the British. If not for them, we would not have been so proud of the city. British era buildings like the Central station, the Ripon building, Fort. St.George, Victoria hall etc are architectural masterpieces. It is however sad that many such buildings are victim to poor maintenance. Most of the buildings still retain the British charm. The High Court complex, built in 1892, is believed to be the second largest judicial complex in the World. The city is also unique for many other things. It is probably the only city where both Rock bands and Carnatic Sabhas are followed enthusiastically. The city can be a delight for a food lover. Dishes such as dosas, idlis, vadai etc are loved by one and all. A visit to Madras is deemed incomplete without a cup of filter coffee. Madras Day celebration is a novel innovation. The day focuses on the city, its history and heritage etc. The younger generation especially is greatly benefited from this.Heritage walks, school exchange programmes, talks and contests, poetry, exhibitions, quizes etc are only some of the events that are going to take place. 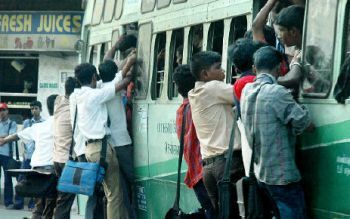 Chennai has once again reinforced the fact that it is the dirtiest city in the country. After reading a newspaper report that said the Cooum river is 80% dirtier than sewage, I felt disgusted about the role of the people responsible. The finding implies that the river water is actually far more toxic than our own human waste in a septic tank. Fish couldn’t even survive for 4 hours in some of the samples collected, even after diluting it 50%. Fact remains only negligible levels of oxygen were present in the samples collected. That the Cooum, along with the Buckingham canal was actually used for drinking purposes 60 years back is pretty unbelievable. Both these water bodies are signs of total neglect presently. The very color of the water suggests the condition. One cannot even go near the rivers as the stench emanated is unbearable. Slums line the banks of the waterways. Even though the water is contaminated, the people from these slums use it for some purposes. Although there are numerous hotels and commercial establishments along the rivers, none of them have bothered to do something about this issue. Now that both these rivers, along with the Adyar river, which is in a better condition, are to be converted into water highways is a sign of relief. Although the authorities are claiming decontamination processes would be on the lines of the one done with London’s Thames river, I doubt of they will ever be able to give a lease of life back to the rivers.